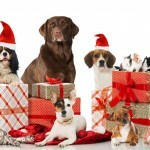 Christmas and New Year is a time for celebrating and having fun with family and friends, but it can be rather stressful for pets. There is also more chance of them becoming ill from eating something they shouldn’t, so we’ve put together this guide to help keep your pets safe and happy over the festive period. 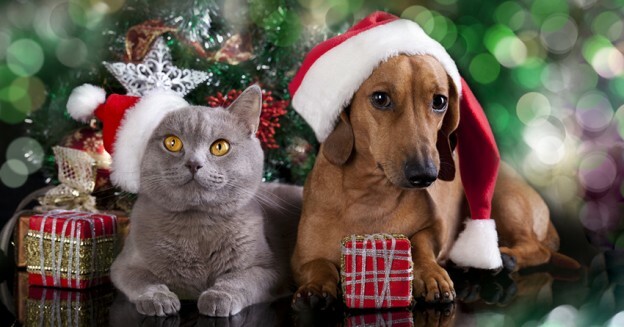 Some pets can suffer from increased anxiety levels over the Christmas period. 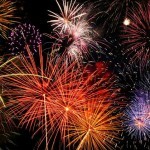 Numerous things can trigger this, from having visitors over, loud noises from crackers and firework displays and excited children running around. Cats are especially susceptible to this, as changes to their daily routine can stress them out. One tip to help keep them calm is to provide a quiet and safe retreat for them. You can put food out for them in a quiet bedroom, and make sure they have an escape route which doesn’t involve weaving past crowds of people. You can also consider using pheromone products and/or herbal medicine to help relax your pets. Many people find that Feliway or Adaptil are effective, and they are available as a spray or plug-in diffuser. Christmas isn’t the same without a big Christmas tree, covered in glittering decorations and twinkling lights. To us, Christmas decorations may help make the home look festive, but to cats and dogs they are something new to explore and play with, and in some cases try to eat! Unfortunately, these can be dangerous and care should be taken when positioning decorations to make sure your pet can’t get at them. Plants – certain festive plants are poisonous, for example poinsettia can cause vomiting, lethargy, excess salivation and depression, while holly and mistletoe can cause vomiting and diarrhoea. Lilies are also very toxic to cats, and even just brushing against one can be dangerous as they could ingest the pollen when grooming themselves. Christmas trees are not considered to be toxic, but sharp needles could cause physical injury if eaten or stuck in a paw, so it’s a good idea to make sure any fallen needles are cleaned up regularly. Tinsel – cats love playing with string, and shiny tinsel is even more appealing! It is not considered poisonous to pets, but it can cause intestinal injuries if eaten, and may require an operation to remove. The same applies to ribbons, so these should be kept out of reach of inquisitive pets. 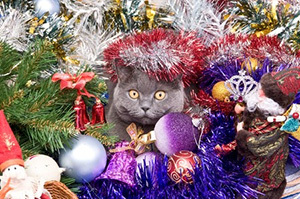 Decorations – cats especially love playing with decorations hanging from a tree, but should a glass decoration be knocked off and shatter, it could cause an injury to your pet. Also should a pet try and eat any small decorations, or parts of one, these can be a choking hazard or cause intestinal injuries if ingested. Our advice is to use plastic decorations on the lower branches of a tree, and keep the more fragile glass ones for places that your pets can’t reach. Christmas lights – if your pet likes to chew cables, then it’s important to keep them away from Christmas tree lights when they are switched on. They may get a nasty shock if they chew through the cable, which could be fatal. It’s also a good idea to not leave tree lights on when you are out, or asleep in case an inquisitive cat tries to climb the tree or playful dog knocks it over. Candles – keep lit candles up high and out of reach of inquisitive pets. Candles can be attractive to pets, so avoid leaving a pet alone in an area with a lit candle. It could result in your pet burning themselves, or causing a fire. 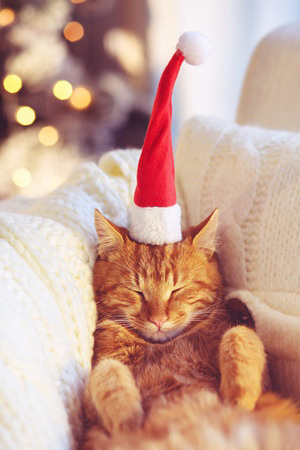 Christmas Tree – Pets can tip over your Christmas tree if they try and climb or play with it. Make sure it has a solid base, and you can even consider tying your tree to something secure to prevent it falling over. Avoid adding anything potentially poisonous to the water for your tree if you have a real tree. Christmas is a time for us to forget the diets and indulge in delicious meals, festive drinks and tasty treats. With food such as Christmas puddings, mince pies, chocolate and Christmas lunch on offer, it is not just us who is tempted to tuck in. Pets too can find these irresistible, especially when food is left out while being prepared. 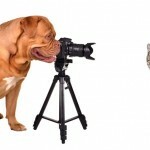 However some of the foods that we enjoy can be dangerous to our pets. Chocolate can be poisonous to cats and dogs, as it contains an ingredient called theobromine. If your pet eats chocolate it can cause vomiting, diarrhoea, lethargy, changes in heart rate and in severe cases, convulsions. It’s important to make sure that chocolate treats aren’t left out where pets could eat them, for example chocolate decorations hanging on the Christmas tree. It’s also a good idea to keep any presents containing chocolate out of reach of dogs too in case they decide to help themselves. Onions (and related foods like garlic and leek) should be kept away from pets too, as these can cause lethargy, weakness and depression. This also includes festive favourites that contains onions such as Sage and Onion stuffing. Grapes are poisonous to cats and dogs, and this includes dried versions too such as raisins and sultanas. Eating grapes or raisins can cause renal failure 24-72 hours after ingestion. 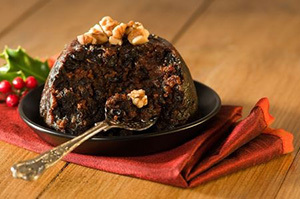 This also includes food that contains grapes or raisins, such as Christmas cake. Alcohol – many of us enjoy a drink or two over Christmas, but remember not to leave your glass unattended if you have dogs around in case they finish it off for themselves. Pets have a low tolerance to alcohol, and it can cause liver damage. Turkey – if you’re feeding scraps of turkey to your pet, remember that once cooked, the bones will splinter easily and can get stuck in your pet’s throat or injure their mouth or stomach. Nuts – Certain nuts such as macadamia and walnuts can be toxic to pets, so keep these snacks out of reach. Macadamia nuts are known to cause muscle weakness and tremors in dogs, and are best to be avoided for cats. Christmas is a great time to treat your pet to a gift, however it’s important to make sure that these are safe. Take care when buying fashionable collars for your cat, as many are designed to look great, but without safety in mind. Cat collars should be a “quick-release” type so your cat can escape should the collar get caught. If you are travelling away from home to visit friends or relatives and are intending to leave your pet at home, it’s a good idea to arrange for someone to look after your pet well in advance as pet sitters and catteries/kennels can get fully booked up. If you are asking friends or neighbours to pop in to look after your pet, make sure that you leave contact details of your vet in case of emergency, and also leave instructions for where to find things like cat carrier baskets in case they need to get your pet to the vet. If you are taking your pet with you, then make sure they have plenty of water with them for the journey, and plan to make stops to exercise them if it’s a long trip. Make a note of the opening hours for your vet, and also their contact number for out of hours emergencies. If your pet requires regular medication, make sure you have stocked up on sufficient supplies so you don’t run out while your vet or pet store is closed. And bear in mind if ordering online, deliveries can take longer than usual to arrive in the run up to Christmas.